Surely it’s easy to answer this: It is telling a story from your head rather than reading it from a book. But storytelling can be a lot more than that. The story may be a simple folk tale told for the sheer fun of it, but that story may work on many levels – it might also pass on cultural values, communicate morals, bind a community, inspire change, or comfort troubled minds. It’s not a passive experience either, storytelling at its best is a two way process in which the audience and storyteller work together. Engaging and memorable, a good story will stay with the listener; it’s like a message which has been passed to them. When written in the context of a story it is much easier to remember. Sue was born and educated in Southampton. She studied Microbiology at University, worked in Youth Hostels in the Peak District and Norfolk, taught in Kirkby in Merseyside for seven years, had three sons, lived in Wisconsin USA for three years and moved to the Isle of Wight in 2000. 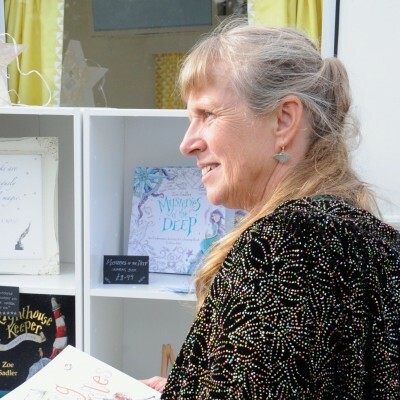 Sue has told stories and run workshops at a number of places and venues over the years including Australia’s Castlemaine State Festival, and the International School in London. Most of her work has been on the Isle of Wight for many of the numerous festivals and community events that take place over here. Highlights have included bedtime stories on the Kidszone stage at the Isle of Wight Rock Festival, Christmas stories by the fire for Forest School and a gecko themed birthday party for an 8 year old. She is always open to new challenges!